Chronic Kidney Disease and Dialysis patients are among the most conscientious (diligent) patients when it comes to maintaining their health the best they can - doing everything in their power to avoid issues and additional complications. While most patients focus on diet, heart health, and improving Dialysis Treatments, a new leading cause of death in those conducting Dialysis is putting the community on heightened alert. Unfortunately, infections have rapidly become the second most common known cause of death among Dialysis patients, according to the Association for Professionals in Infection Control and Epidemiology (the branch of medicine that deals with the incidence, distribution, and possible control of diseases and other factors relating to health). Use the following lesser-known tips and insights to avoid dangerous and life-threatening infections. Keep Dialysis Access Sites Covered: Since Dialysis Access sites (AV Fistulas or Grafts) allow for the entry and exit of blood, either through a catheter or through puncture with a needle, they can also serve as a possible entry site for germs. Hence, cover your Dialysis Arm with the Dialysis Arm Sleeve (click here) to help avoid catching infections while living your life. Site infections may occur from leaning on counter tops, relaxing back in a chair, hugging a loved one, playing with kids/grandkids, playing with pets, gardening, mowing the lawn, and more. Report Any Signs Of Infection Control Failure: Patients play a key role in helping to limit the spread of infections in their Dialysis Facilities. If you attend regular Dialysis Treatments at a local center and realize that Patient Care Technicians are not wearing gloves, washing hands, waste is not being appropriately disposed of or other issues that may cause infection are noticed, then bring it to the attention of your Social Worker. If nothing is done, then contact your Dialysis Center Manager. If still no action is taken, then email KidneyBuzz.com directly at contact@kidneybuzz.com and we will provide further resources. Wash Your Hands: Bacteria and viruses can be on doorknobs, sink faucets and newspapers. If you touch something that someone who is ill has touched, you risk getting the same infection. Be especially diligent to wash your hands after Dialysis Treatments and when you visit the hospital. Wash Your Dialysis Bag: Many patients do not realize that they are dragging germs home with them when they do not wash their Dialysis Bag and blankets. When you place your Dialysis Bag on the ground around your chair or on the armrest, there could be germs that remain on your bag until it is washed. Try to wash you bag once a week. Also, be sure to get your Dialysis Patient Bag by clicking here - it is machine washable and expected to last hundreds of Dialysis Sessions. Wipe Down Your Dialysis Chair: Sometimes Patient Care Technicians are in a rush and do not have the opportunity to thoroughly wipe your Dialysis Chair. Make sure that you bring your own wipes or ask your Patient Care Technician for a few sanitization towels to wipe your Dialysis Chair down before your treatment in order to try and avoid infections. Also, Dialysis patients may consider cleaning their fistula sites with "soap and water" before every Dialysis Treatment to help prevent bacteria from entering your site, according to the Centers for Disease Control and Prevention. Seek medical attention immediately if you develop symptoms such as fever, uncommon fatigue, loss of appetite, nausea, vomiting, and/or changes in mental activity. Sometimes patients on dialysis do not develop a fever when they have an infection, so all symptoms are important. 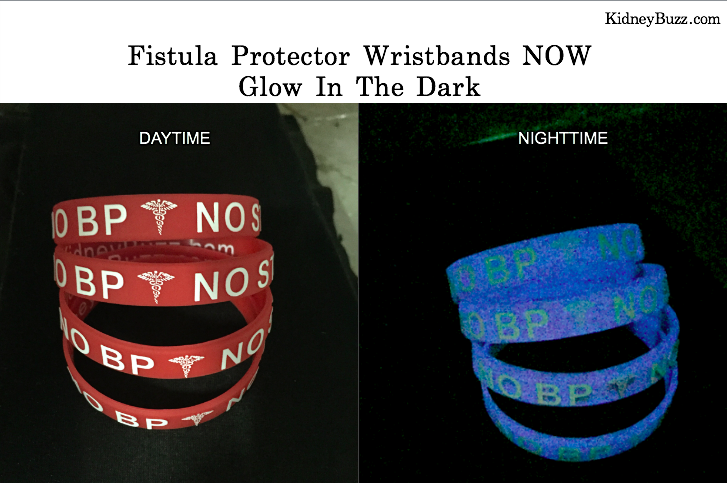 What's more, prevent your AV Fistula from being mishandled during an emergency by wearing your Fistula Protector Wristbands (click here). Recommended Reading: Mold Infection Kills Five Transplant Patients. Kidney Transplant & Dialysis Patients At Risk. How do you protect yourself or loved one from infection? Your insights could be very helpful to other patients so share your responses with the over 70,000 friends who have liked the KidneyBuzz.com Facebook Page (click here). Also, consider following the nearly 250,000 monthly visitors on KidneyBuzz.com for your Number One (1) source of Daily News, Information, Impact Meals, Inspirational Quotes, and tailored Products and Services which teach Chronic Kidney Disease, Dialysis, Kidney Transplant, Diabetes and High Blood Pressure patients how to better manage and improve their lives.